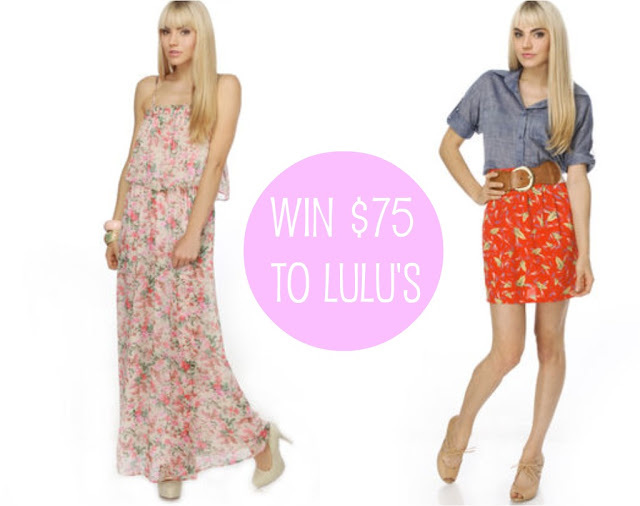 I've partnered with Lulu's to give one lucky a reader a chance to win $75 to shop their store! Lulu's offers cute and affordable clothes and accessories. I'm a fan of their selections (seen here, here and here).This contest is open to US and Canada readers only. Head to Lulu's and check out their items and tell us which ones are your favorites. Giveaway open from Wed April 20th through Monday April 25th. One entry per person please. Oh wow they have so many amazing items it's hard to pick my favourites! Oh this is so great! I love the Pigment of Your Imagination Print Dress! The open back and pockets are gorgeous... plus that painted looking pattern is to die for! Oh my gosh! I love love love Lulu's!! I bought my NYE dress from there. It was this one http://www.lulus.com/products/just-luster-one-shoulder-black-dress/31635.html. I bought a small, but it was too tight at the bottom so I exchanged it. They lady I talked to was so nice and helpful. I have a wedding to go to in Cali at the end of June and I've been looking at their site to buy a new dress. There stuff is so cute and affordable :) I want everything! Shopping for graduation dresses is so much fun!! I love the Cimmerian Sway Black Skirt. This time of year I live in skirts. This new shape is so much more interesting. Thanks for the give-a-way! i adore the curious quest beige lace skirt. its super adorable! thanks for the giveaway! Lulu's is my favorite!! And I have my eye on the Jar of Sprinkles One Shoulder Maxi Dress... so gorgeous!! Jack Lynette Slate Blue dress! I love LuLu's. It's mostly affordable and totally cute! I really like the Cimmerian Sway Black Skirt! I love the beachrider neon pink shorts, the anita blue sheer top.... and just about everything on the site! I love Lulu's! Wow! Where do I even start?! I LOVE the Cimmerian Sway Black Skirt and the Exhibit A Cutout Coral. Everything is so feminine and lovely, and most importantly, affordable! The marker magenta top is gorgeous and goes with everything. I could see myself wearing it with jeans, a cute pencil skirt or something floral. Love it! Looooooove LuLu's! I am very much loving the Tulle Apricot Preserves Floral Dress. So cute for summer! I love neutrals & the green is a perfect pop of color for spring! the sailboat, scalloped shorts are adorable. so are all the dresses! thanks for the giveaway! I have my eye on either the JC San Diego shoe or the JC Moochie shoe. Such a great giveaway, thanks for sharing it, Taylor! I love the tight corners print dress.. And there are sooo many pretty shoes!! I love the Zoetrope black and white striped top, the Fare Thee Well Cream Lace dress, the Just Breathe top, and probably any pair of their shorts...what a great selection! I could see myself in the Sheerful Moniker Navy Blue Dress so pretty! I just love Lulu's! I think the Tulle Apricot Preserves dress is my favorite. It would be perfect for a summer wedding! I always love their flats. I'd probably pick up a cardigan for the chilly spring nights we're still having and then the Knitted Dove Cute as a Button skirt in white for when the weather turns warmer! Love Pigment of Your Imagination Print Dress! in LOVE with the gold glitter pumps. Beautiful! Great giveaway! I'm a new reader so thanks for putting out such a great blog. I really do look forward to reading what you are up to every day. If I won, I'd definitely swipe the RickiRack Strapless Navy Blue Dress or the Carmel Macchiato Striped Dress. Def love Mercutio's Muse Champagne Top !!!! I was literally just on there last night! Great timing! I'm digging the sugared mango orange print dress. Very cute! I seriously love the fringe top!! what a tough choice! how adorable is the little bow navy crop top? i guess that would be one of my faves! I really love their BB Dakota Olive Green Skirt. It's gorgeous! I am totally loving the Collective Concepts Strawberry Mochi Maxi Dress. It's perfect for summer! Thanks for a great giveaway! Love LuLu's!! What a fun giveaway! I would buy the Bamboo Leopard Toe-Bow Ballet Flats, My Favorite Marker teal top and Wind on the Waves strapless teal dress! I LOVE Lulus! Here are my favorite pieces: the Puff Pastry Lace Dress, Tight Corners Orange Print Dress and the Mercutio's Muse Top. wow $75 would go a long way! I love the Just Get Dance-y Mocha Brown Top! Thanks for sharing! i love the lily pond lane yellow mini! I really need some shoes and I love lulus!! I love the gomax sienna leopard flats and the chelsea crew navy canvas wedges. I'd get multiple things I need: Bamboo Blkberry 55 Ivory Crinkle Toe-Bow Ballet Flats; Waltz of the Flowers White Top; and (for fun and style's sake) Foreign Appeal Navy Blue Pants. Tulle Lily Pond Lane Yellow Mini Skirt & most of their shoes!! Thank you for doing this...but how do you choose?! I would get the Citrus Cooler Orange Maxi Skirt. Great color for Spring! I love all the dresses and one of my favorites are Farmer's Market Navy Blue Dress!!!! Hope I win!!! i really like some of the dresses and flow-y tops! Ohhhh yes!!! I would love a pretty maxi dress from Lulus!!! Great giveaway! :) Love Lulus! My faves are: Exhibit A Cutout Coral Dress, Not Rated Black Gaga Tacked Slingback WOW Wedges, El Mirador Beaded Bib Necklace, and especially the Hot Seat Black Lace Shorts! Love them! I love the Collective Concepts Salzburg Festival Floral Maxi Dress, I need this dress for my upcoming Mexico trip! It's impossible to pick just one item! I'm torn between two: the Firefly Rendezvous Ivory Lace Dress and the Puff Pastry Lace Dress. I normally never wear red, but the Ricki Rack strapless dress is calling my name!! I love the Bamboo Blkberry 55 Ivory Crinkle Toe-Bow Ballet Flats (so much, in fact, that I just ordered them. Also, loving the Firefly Rendezvous Ivory Lace Dress. i reallyyy love Pigment of Your Imagination Print Dress ..
i love the combination of colors and the back of the dress. amazing!!! I love the pigment of your imagination dress. I love the "Walk the Talk" red dress! Cute with or without leggings! I have always adored this site. I love the coral cut out dress and the blue brandy melville shirt. So much great stuff! I like their jewelry, love the Zad Ganesa Turquoise Silver Ring and the Tulle Apricot Preserves Floral Dress. Thank you for the giveaway! Love the Gaga tacked swing back wow wedges. I've been looking for a pair that's similar for quite some time now! I have been loving Marilyn's Morning Floral Dress lately. I love how bright, sunny, and cheerful it is for spring! Love the Dolly's Day Drive Red Dress. I am going to win one of these one day, I swear! Woh, they have some amazing jewelry! My absolute favourite? 'Zad agate ring' because I'm currently obsessed with agate stones! Totally LOVE it! I love the citrus cooler orange maxi skirt. wow, some super cute stuff! i'd choose the puff pastry lace dress -- its gorgeous! and there were about a million pairs of shoes i'd want too!! They have THE CUTEST rompers! Love that floral skirt, so perfect for summer! Ohh--I love the fare thee well cream lace dress. This is so hard to pick just one item! Love nearly everything Lulu's. The creative concepts floral maxi featured above is one of my favorites that I've had my eye on.. and marilyn's morning is fun for spring! I LOVE the swing, swing, swing pleated beige skirt. SO cute. Thanks for the giveaway! Oh gosh, everything!! I really love the azure blue heavens romper. I love their prices, most of all. I think I'd stock up on a couple of little black dresses, like the Terpsichore's Lyre Black Maxi Dress or the Au Revoir Strapless Dress or the Cool Shoulder Black Dress. Thanks for the chance to win. xo. I loooove the Exhibit A Cut Out Coral Dress and the Tulle Apricot Preserves Floral Dress...plus too many pairs of shoes and accessories to count! I LOVE the "Zad Love Swallow Necklace" in gold, and also the "Owl Pal Wristlets" in green! I have had my eye on both for quite awhile! Matiko Emilie Taupe Suede Chain Mail Cross wedge... love them! I love Lulu's!! they have fantastic shoes- including the matiko emilie wedges! I love the "Love makes the world go round" Grey purse--so cute! Loooove the "Incoming Tide Purple Strapless Dress" - so cute! The Sailboat Photography Black shorts and the San Francisco Bay Blue Tank. To top the outfit off, I would also wear the CanvasDainty Bow Wedge's in black. That would be the perfect summer date outfit!! if i were to win this gift card i would buy the CityClassified Koala Brown Studded Ankle Strap Chunky Heels, the beautiful Gladiola Shadow Purple Top and the Gemtastic Gold Necklace to finish off the outfit!!!! What a wonderful give away! I'm in love with the Brown Sugar Bonanza One Shoulder Dress!! I feel as if I would wear the Night at the MoMA Black Dress every evening, and i'd wear the Dolly's Day Drive Navy Blue Dress every day. Micheal Antonio Gayla Brown Snake Print shoe! O.MY.DAYUM! MUST HAVE! Wow I hope I get chosen as the lucky winner! The Pas de Bourrée Black Skirt please!!!!!! i think it's the perfect little red dress. I love the Margaret Blush Pink dress! I just love the See Thru Soul Selena Green and Purple Floral Dress for all the summer weddings! Oh man, it is so hard to pick and choose! I love just about every pair of shoes on here though, especially the Bamboo Lorie 01 Natural Crinkle Cross Platform Heels. Love their High Sass Strapless Navy Blue Dress! I'm all about navy blue! I love their scrunchy face red top! thanks for the chance to win! They have a great collection of tops!!! They has some fabulous stuff! I love the Boysenberry Popsicle one shoulder dress & the City Classified Archer Black Braided sandals! I currently have my eye on the Citrus Cooler Orange Maxi Skirt and the Mink Pink Latter Day Saints Floral Maxi Dress. I need some more comfy maxis! Ohh ohh! I am loving the Nina Sheona Capri Fuschia Luster Satin Studded Chunky Heels--wow, thats a mouth full!! i've been eying that floral dress you have pictured for a while! I LOVE the El Fuerte Teardrop Necklace, the Renaissance Revivial Peach Dress, and the Into the Hue Teal Tank Top. And don't even get me started on the shoes! The heels are fabulous but most of them are pushing 5 inches and I'm already 5'10"! Amazing giveaway, i just want to focus on getting tons of skirts and dresses for summer! http://www.lulus.com/products/louis-xiv-beige-lace-shorts/35881.html I know these are sold out my i love them! Loving the Qupid Saydie 25 Taupe T Strap Wooden Heels and the Madeleine Cookie Romper! Want SO badly for spring! Love the Tulle Apricot Preserves Floral Dress. Adorable! Thanks for this giveaway! Such a cute blog! Oh my gosh, I seriously love Lulu's completely. What item isn't there to love? At the moment I'm loving all things tribal print on their site; such as the Soda Privy Brown Beaded and Braided Thong Sandals. I love the Superfine Lace White Tank Top!!! Cosmopolitan Coral Dress! My favorite color and my favorite piece of clothing! I love Lulu's! I just bought some shoes from them :) I really love the Nina Sheona Capri Fuchsia Luster Satin Studded Chunky Heels. Dying for the Speed Limit 98 Jones Gold Glitter Platform Pumps and Escape from the Zoo Navy Blue Dress! MUST HAVES. I like the Eve the Explorer Olive Green Dress! And the jewelry they have is amazing! I love the Pitter Patter Strapless Peach Dress as well as the Snowberry Lane Lace White Dress!!! I'd have to decide between the Pas de Bourrée Black Skirt, BB Dakota Wisner Black Skirt, Little Bow Chic Navy Blue Crop Top, and about 20 different dresses! I love Lulu's! i love the dolly's day drive dress! and i've never heard of lulu's... where have i been? thanks for the introduction! I really like the Tulle Lily Pond Lane Yellow Mini Skirt! So cute and easy for summer! i always go for shoes! love the black T-strap platforms! Love lulu's!My favorites are the sightseeing in sicily taupe top and the billabong rhythm orange print dress. I love the strapless silver extraterrestreal dress. I would love to win this giveaway! I love the Getaway Weekend Khaki Sweater Top...it is just so comfy looking! Michelangelo's Vision One Shoulder Ivory Dress! Needs to be mine for my rehersal dinner! Thanks for hosting this fabulous giveaway! Ooh, I love the great deals you can get from Lulu's! (http://www.lulus.com/products/collective-concepts-island-romance-red-floral-dress/32872.html)- perfect for a night on the cruise watching the sunset. I also love the Many Belles Down Hammer Time Blue Dress (http://www.lulus.com/products/many-belles-down-hammer-time-blue-dress/36535.html)- with a brown belt and sandals, this would be perfect for strolling along a pier. I love the Planetary Motion Purple and Gold Skirt. I love love the Qupid Saydie 25 Taupe T Strap Wrapped Platform Wooden Heels! Perfect with both jeans and skirts/dresses! No way! All I'm going to partner with them also. They have the cutest purses! The Getaway Weekend Khaki Sweater Top & the Tulle Lily Pond Lane Yellow Mini Skirt! Lulu's is known to have an epic shoe collection (at great prices)sooooo I would probably choose two pairs:) The Bamboo Lorie 03 black sandals and Michael Antonio Galactic sandal in red. Both perfect for those summer walks. Loving the Fare Thee Well Cream Lace Dress! I've been on the hunt for a pair of flats to go with nearly everything...the Soda Pozo Gold Metallic Ballet Flats are perfect! I can totally picture then with a range of things from cutoffs to flowy summer dresses; very cute! There's so many that I want (can't choose which of the shoes! ), so I'm listing the Action Woman Pink Purse! I would love the BB Dakota by Jack Hopper Beige Jacket. Wow! So many great things, it's hard to narrow down the favorites! I am really loving the Fruit Cocktail One Shoulder Dress (too bad it's sold out), the Swing,Swing,Swing Pleated Black Skirt, Here Kitty Kitty Leopard Print Scarf, and the Zad Agate Rings! I love the Cimmerian Sway Black Skirt. It is trendy, yet versatile. Romantic, yet bold. I have to have the Mesa Me Crazy Striped Dress and the Paprika Clovis Tan Woven Cork Wedge Sandals! Love! Love the collect concepts Island Romance dress in red! Love LuLu's and I love your blog! I've been wanting to order the "Riverboat Colloquy Striped High Low Dress" for a while now...so Ill be crossing my fingers! I'm a huge fan of LuLu's, and I think your style that perfectly balances feminine with masculine elements is influencing my choices. I'm madly in love with the Pas de Bourrée Wine Red Skirt and would style it with the Wine Tasting Ivory Print Top for day and the Picking Petunias Pink Top for dinner or a date. I love love love the Sailboat Photography Black Shorts! I'm a big fan of Lulu's so I'm excited about this contest! Super cute stuff! I love the Incoming Tide Purple Strapless dress and the Qupid Turquoise Platform Sandals!! Ohhh I love Lulu's!! I've been obsessed with maxi dresses lately and I've had my eye on the Floral Trimmings Maxi dress for a while now! love the Tulle Apricot Preserves Floral Dress and CityClassified Garage Black Canvas Dainty Bow Wedge Sandals! Super cute stuff! I love the Gilded Garland Strapless Lace Dress !!! There are so many items I like on the website, but these are the items that stuck out to me most the Rocket Dog Orientma Blue Masai Ikat Print Pumps, Steve Madden Riddgge Blush Patent Leather Wedge Heels, Mints Meet Mint Green Top, Obey Strapped Grey Top, and Knitted Dove Cute as a Button White Skirt. Oohhh..what a fun site! I love these shorts! Love Lulus! I want everything:) Specifically the jewelery I want The Over the rainbow necklace, and The swirly girly hoop earrings. Oh and the Puff Pastry Dress. Hope I win! I'd pick the BB Dakota nydia floral dress! Crossing my fingers! So many cute items to choose from!! I really like the Insight Arosed Floral Denim Shorts. The print has a great vintage look. I love the one shoulder pink maxi dress by Euterpe's Elegy. It'd be perfect for my trip to Europe in July! I love the Gilded Garland Strapless Lace dress. So pretty! I love all of their dresses! It is so hard to choose. I;m in love with the Yellow Meadow Enchantment dress. So dreamy and beautiful! Firstly, I would like to say I love your blog! It's awesome. As for Lulu's, this is difficult. i love all the dresses... i cant pick! Love the Bohemian Butterfly Necklace and the coral bow Radley Ballet Flats! Love the Au Revoir Strapless Black Dress! Perfect for summer lounging or to dress up for a night out. I love their dresses! I would probably treat myself to one of those. the CityClassified brown ankle strap sandles are without a doubt the cutest shoes i've seen in a long time! I'm loving everything at Lulus, specifically though, the Not Rated Black Gaga Tacked Slingback WOW Wedges, the Cimmerian Sway Black Skirt, and the Au Revoir Strapless Black Dress. Love the Chelsea Crew Oxford wedges!